HBO’s The Wire is done. I am adding the second of my three postscripts to the show. This second postscript speaks to the Asian, more specifically the Chinese presence in Baltimore. 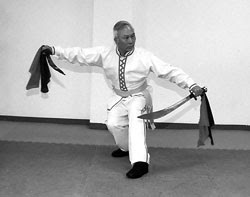 The gentleman in the photograph is Shiye Huang Chien-liang, my teacher and the 64th generation grandmaster of the Tien Shan Pai system of Chinese martial arts. Shiye Huang has lived and taught in Baltimore for more than 25 years. In the Owings Mills section of the city he owns and directs the U.S. Kuoshu Academy. The word “Shiye” means teacher and advisor.